Having just joined the 50s Club, I was excited to be asked to write an article for a site that focuses on being fabulous after 50! Particularly, when it was on my topic of expertise, innovation, and posed such a provocative title. First of all, we need to broaden out the concept of what it means to be innovative. Being an inventor, and being an innovator are not necessarily the same thing, and whilst men dominate the STEM (science, technology, engineering and mathematical industries), and only 7% of women in the UK are technological inventors, although the trend is rising, it is a well-known fact that many patents end up collecting dust in the registries of organisations, or never see the light of day. To be innovative means to be able to create a source of value, out of a new idea, or an idea that is new to you, and women are forging the way forward in value creation leading the trend towards what the Kauffman Foundation calls the “Decade of the female entrepreneur”. Even in large organisations, we are seeing a correlation between profitability and gender diversity, and whilst being profitable isn’t necessarily always driven by new ideas, organisations are more likely to enjoy above average profitability if they employ more women. McKinsey & Co examined over 1,000 companies across 12 countries and found that firms in the top quartile for gender diversity are 21 per cent more likely to enjoy above-average profitability than companies in the bottom quartile. Secondly, whilst we need to encourage more women into the STEM related industries, we also need to broaden out the concept of innovation beyond research and development and technological or scientific advancement. Innovation can happen in processes, services, experience design, marketing, customer relationship management, business models and more. Where ever we are applying new ways of thinking to create new sources of value, we are innovating. 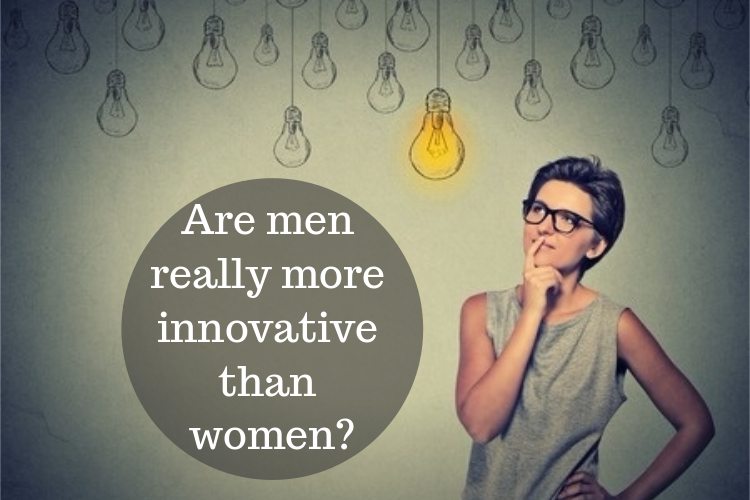 The question to really ask ourselves is not whether men are more innovative than women, which can limit our thinking, but how do we harness the diversity of our strengths, whether it be gender or otherwise, to create value from new ideas. From my research, I have found six distinct profiles to be key, what I call the 6 ‘I’s® of Innovation. Understanding your unique strengths in these six areas will help you to realise, that whether working for an organisation or as an entrepreneur, whether you are starting a new business, or leading a new project at work, we can all innovate and contribute to bringing new ideas to life. And now, in the second half of our lives, in the fabulous 50s and beyond, we have a mountain of value on which we all sit; our experiences, our knowledge, our networks and our know-how, and the question is, what is my PURPOSE now? How can I bring my gifts, talents and strengths together to find new opportunities to create value from new ideas and where is the best place to start? Yes, You Can Innovate! Published in Fab after Fifty.